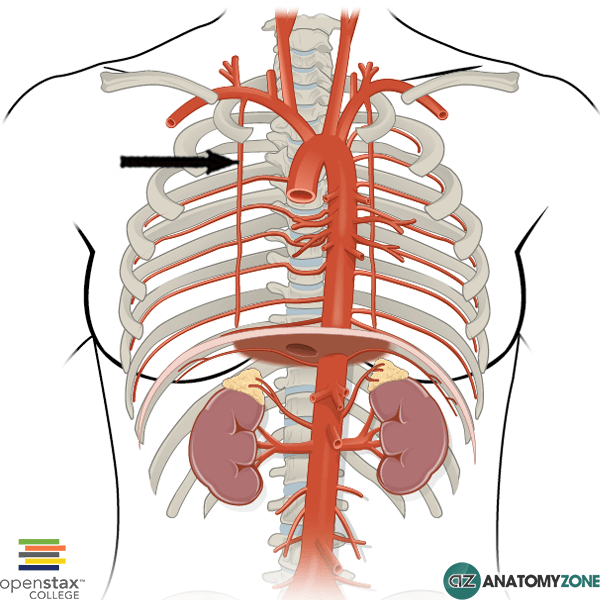 The structure indicated is the internal thoracic artery. The internal thoracic artery was formerly known as the internal mammary artery and is an artery located anteriorly in the thorax. It is a branch of the subclavian artery. The internal thoracic arteries descend lateral to the sternum on either side, and give off several branches on the way, including the 12 anterior intercostal branches which anastomose with their counterpart posterior intercostal arteries. The internal thoracic artery terminates by dividing into two branches: the musculophrenic artery and the superior epigastric artery.